Sometimes all it takes is a few piano keys and a fuego flow to make a song go the distance. Case in point: "Mobbin," the latest single (and video) from talented up-and-coming emcee Dash Flash. Joined by West Coast spitter D Savage, Flash delivers an infectious track that will undoubtedly be bouncing around in your head all day, if not all week. 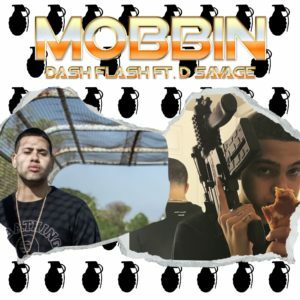 Flash, who was born in New York but later moved to Connecticut, flaunts an effortless rapid-fire flow on "Mobbin," and D Savage adds his own unique flavor with a sing-songy steez that compliments the piano melody to a tee. Both of these gifted spitters don't need to try very hard to leave an instrumental leakin', which is probably why they're just maxin' out and enjoying themselves in the video, which you can peep out below. If you're funkin' with Dash Flash, definitely be on the lookout for Make History, his upcoming project that is surely going to pack some serious heat. And cop "Mobbin" here so you can keep this joint on rotation while you post up with your team. GrownBoiTrap and D Savage team up for "Lit"
Cutthroat Records' D Savage releases "I Know II"